Bar stool supporters and glory hunters all over Ireland can barely contain their excitement as the start of the new English Premier League season is finally upon us. Pubs nationwide will once again be packed with people referring to football teams from another country as “we” while getting into arguments and fights with other Irish people who refer to other English teams as “we” even though none of them are from those places and most of them have never been there. We spoke to some Irish fans ahead of the big kick-off to get a taste of the excitement and giddiness that builds around the country at this time every year. Of course if Scunthorpe United were the biggest club in England then Ian and half of Ireland would be massive Scunthorpe fans and hate Grimsby but as somebody once said – it’s a funny old game. Indeed the sale of English Premier League shirts in Ireland has never been more popular than it is today. James Molloy is retail sales manager with Lifestyle Sports and he told us business is booming and always picks up around this time of year. Meanwhile FAI officials have said that security procedures at the Aviva Stadium in Dublin are to be reviewed after last week’s friendly between Liverpool and Napoli. 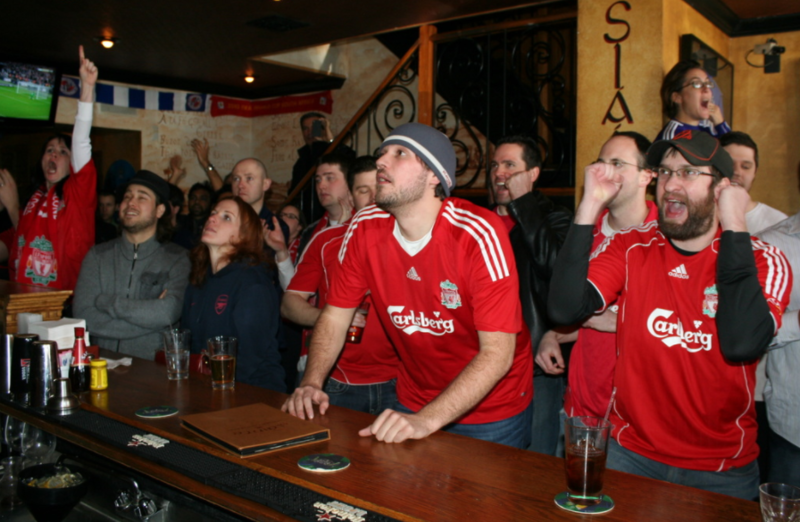 There was major crowd congestion and kick-off had to be delayed for over an hour as more than 50,000 Irish Liverpool supporters tried to get their bar stools through the turnstiles.